Experience the charm, character, and life of Kingston, Jamaica in this brand new beautiful studio nicknamed “Above it All”. Decorated by our in-house interior decorator, and is now a proud member of prohomesja's Caribbean Luster line of homes. This Kingston Jamaican vacation home is a brand new, modern loft studio apartment. This gated community is guarded 24/7 by a professional security detail. This vacation condo is located only one minute drive from New Kingston, Kingston Jamaica’s business and entertainment district. So if you are looking for comfort, security, and vintage modern living…look no further. You have found it! The open-concept layout vacation rental boasts high quality porcelain finishes and red concept décor all throughout. Through the entryway, guests will find the splendid décor inspired living area; complete with a contemporary-styled sofa, as well as a 42” wall mounted Smart TV with cable and wireless internet throughout. Kingston city cottage has two bedrooms, one located downstairs and one upstairs. There are two pillow-top king-sized beds in this loft studio apartment, one in each bedroom, complete with ultra modern dark brown wooden headboard and matching chest-of-drawers and night table are all you need to relax in fine style and comfort. There are also two en-suite bathrooms, the bathroom downstairs comes complete with sleek glass-enclosed shower, solid white wood bathroom cabinets with large mirror, fashionable design and granite wash basin. The upstairs en-suit has a walk-in shower with a view of Kingston to die for!. Just outside the apartment, you will enjoy well maintained manicured lawns with concrete garden bench for you to unwind even more. 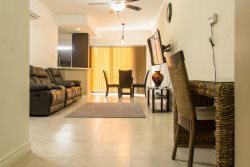 Reserving this stunning vacation rental for your holiday or business travel to Kingston, Jamaica will afford you the luxury of a boutique hotel with the unique local experience of an apartment rental. Make your dream vacation come alive…book “Above it All” today and thank us later! Great Experience! Will definitely visit again.